With its exceptionally bold looks and considerable road presence, the Kia Soul is a car for drivers who are happy to turn heads. The chunky silhouette of the Soul makes for a highly practical interior and you won't find yourself short on space. 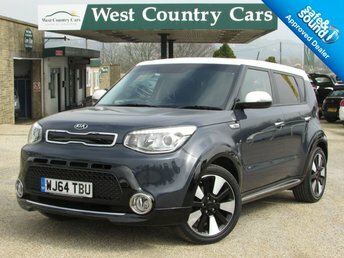 West Country Cars Yeovil Ltd is a top supplier of used Kia Soul models in Yeovil so be sure to take a look at our latest deals when searching for your next vehicle. We list all of our used cars online and a member of our knowledgeable and friendly showroom team will be more than happy to walk you through the vehicles in stock. Finance is available to UK residents aged 18 years or older, subject to status. Terms & Conditions apply. Indemnities may be required. Other finance offers may be available but cannot be used in conjunction with this offer. We work with a number of carefully selected credit providers who may be able to offer you finance for your purchase, commission may be received. We are only able to offer finance products from these providers. Postal Address: West Country Cars Yeovil Ltd, Barrows Hill Garage, East Chinnock, Yeovil, Somerset BA22 9ER. Find contact details here. West Country Cars Yeovil Ltd is authorised and regulated by the Financial Conduct Authority, 665083. All finance is subject to status and income. Written Quotation on request. We act as a credit broker not a lender. We work with a number of carefully selected credit providers who may be able to offer you finance for your purchase. We are only able to offer finance products from these providers.